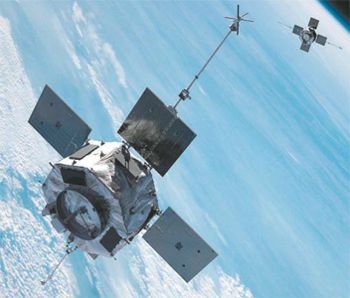 NASA's Radiation Belt Storm Probes deployed a series of booms include electric field antennae spanning 100 meters. The instruments studied energetic particles, thermal plasma, ionospheric composition and electromagnetic fields and waves. Magnetospheric Research satellite for NASA JHU/APL, USA. Launched 2012. Status: Operational 2012. First Launch: 2012-08-30. Last Launch: 2012-08-30. Number: 2 . Gross mass: 648 kg (1,428 lb). The principal investigator for one experiment, the relativistic proton spectrometer, was at the National Reconnaissance Office. Family: Earth. Country: USA. Engines: MR-103. Launch Vehicles: Atlas V, Atlas V 401. Launch Sites: Cape Canaveral LC41. Bibliography: 6819, 13010. 2012 August 30 - . 08:05 GMT - . Launch Site: Cape Canaveral. Launch Complex: Cape Canaveral LC41. Launch Pad: SLC41. LV Family: Atlas V. Launch Vehicle: Atlas V 401. RBSP A - . Mass: 648 kg (1,428 lb). Nation: USA. Class: Earth. Type: Magnetosphere satellite. Spacecraft: RBSP. USAF Sat Cat: 38752 . COSPAR: 2012-046A. Apogee: 30,513 km (18,959 mi). Perigee: 596 km (370 mi). Inclination: 9.90 deg. Period: 538.80 min. NASA's two Radiation Belt Storm Probes deployed a series of booms include electric field antennae spanning 100 meters. The instruments studied energetic particles, thermal plasma, ionospheric composition and electromagnetic fields and waves. The principal investigator for one experiment, the relativistic proton spectrometer, was at the National Reconnaissance Office. RBSP B - . Mass: 667 kg (1,470 lb). Nation: USA. Class: Earth. Type: Magnetosphere satellite. Spacecraft: RBSP. USAF Sat Cat: 38753 . COSPAR: 2012-046B. Apogee: 30,662 km (19,052 mi). Perigee: 606 km (376 mi). Inclination: 9.90 deg. Period: 541.70 min.